The original film was a short tale of a little elephant learning to live without his mother in this cruel world, dealing with others making fun of his appearance and learning how to embrace what would make him special. The Burton retelling of this film has that same core element, but broadens the scope to include more of the human characters that were only briefly glimpsed in the animated film. While the original story beats still hold the retelling to a certain timeline of events, the broader aspect and focus allows the storyteller to go a bit further into morals and lessons. To start, I’ll give a spoiler free overview of the film. I don’t really follow film and tend to gloss over technical elements such as cinematography and color palette. I can say that the last Burton film I really enjoyed was Sweeny Todd (2007) and Big Eyes (2014), which I never even realized was a Burton film because it didn’t have many of the elements that typically point to him as a part of a film. The Alice films were never my cup of tea - I didn’t even bother with any past the first one because I just did not care for the weirdness of that film - and I never got around to watching Miss Peregrine’s Home for Peculiar Children. The little I can tell you of some of the “Burton” films is that they are typically odd, dark in both tone and color, and some interesting uses of computer graphics or visual effects. With Dumbo, we have a mix of these elements. The movie sticks with the baby elephant being separated from its mother, but also explores the human characters that inhabit a circus. The highlights of the animated film, including the Casey Jr. map scene, Baby Mine, and Pink Elephants are hit really well; however, the statement of seeing a horsefly, dragonfly, and housefly was given to us by the most disappointing casting of a character. I am happy this wasn’t a beat by beat remake, though I wish there was a bit more development to allow the story to hit the marks it wanted to hit. While it’s not a dark film, in fact the color palette, while muted, does explore the uses of bright reds, deep blues, and vibrant yellows, there are some pretty dark tones for a Disney film based on an animated film from the Nine Old Men, including the death of a character pretty early on. There are a lot of players in this movie too, but a couple that mainly stick out. Danny Devito’s character lends some hints of humor while Colin Farrell’s character gives us the sympathetic hero coming back from war to a home that is not the same as when he left. There are also the children, who honestly were inconsequential to the movie. I feel they place in two kids but divided the personality between the two that neither felt truly fleshed out, and I didn’t really care for the direction they gave to the daughter. Overall, the addition of humans didn’t do much for the story. There were also some really bad CG animation moments that made me question what the budget was on this film. The movie definitely had a lot of story to tell, but it felt as if it wanted to tell more and edits precluded that. There were characters that were made to seem important but were never given a lot of time. And despite being the titular character, we don’t spend nearly enough time with Dumbo. While he didn’t talk in the original animated one either, we got more interaction with him because we saw him through Timothy the mouse’s point of view and animals speaking to other animals made sense. It felt as if they didn’t want to commit to having the viewer suspend disbelief and accept that these humans and baby elephant can understand each other. I’m not sure if this would have been the better route because without it, you are left with little Dumbo in the Dumbo film. Ok, so what is the verdict here? I can’t honestly say. The movie left zero impression on me - which can be both good and bad. It didn’t hit me as hard as Alice to the extent where I was like well, that was a waste. However, it did not impress me to the extent that Jungle Book did (I know I’m jumping directors so maybe say Big Eyes or Corpse Bride). I will say that it’s crazy that the studio that made Jungle Book, whose animated animals looked super realistic, put out Dumbo where the CG animals looks completely rubbery and pasted into the human world. I think it’s worth seeing if you have kids and want to bring them to the movies. I don’t think it’s one you have to rush out to see. And if you were a big Dumbo fan, I truly wonder how this will impact you because it doesn’t trash the original but it extends the original story enough to make it more of a retelling rather than a straight remake. Want to talk spoilers? Ok - let’s discuss SPOILERS. First, I really didn’t care for the daughter in this film. I believe it was summed up best by saying she acted like Athena did in Tomorrowland; however, this character was later revealed to be a robot, hence the oddness of her acting made sense. The daughter in Dumbo was not a robot, so her acting like a robot was not great. Danny Devito was stand out - he was the spark of humor that was missing in many other characters. I didn’t get a chance to connect with Farrell’s or Green’s characters, which is bad since they’re behind some of the bigger moments in the film. While Green was lovely as always, it was hard to determine whether she was a good guy or bad guy and where she fell in the plot. Farrell just didn’t hit it for me - he could have been replaced with any other actor and I wouldn’t have noticed. Keaton was great but the big business villain has been done a lot and there was no “twist” in the reveal that he wasn’t on the up and up. So overall, the characters were lacking, which is disappointing since the promise of this film seemed to be the focus of the human characters in the circus surrounding Dumbo. I do want to talk about the “lessons” of the film, since that seemed to be a big part of what Burton was trying to do here - teach us something. What that was could be a little weird in a Disney film, however. We still have the basic lesson of not judging someone/something just because it looks different than you or seems a little funny. There’s a little more to this with Farrell’s character - who comes back from war missing his arm and is judged for this, first by his kids and then by everyone else’s stares. He’s also not allowed to go back to his old circus act of riding horses and is instead placed in charge of the elephants. Yet, the way he is prevented from returning to his act doesn’t streamline into the moral of not judging someone by their appearance and thinking a disability automatically equals a handicap - it’s because they literally don’t have the horses anymore so he couldn’t show he could ride again even if he wanted to. If the film had played it that he wasn’t allowed to ride, instead of just not having access to the horses, it would have been great to see Farrell overcome this injury and prove he could still ride, wowwing everyone with his talent again. When he does eventually get up on a horse, it just misses that moment of punch and pizzaz. The lesson behind Keaton’s villain is probably the most interesting. So the setup is Keaton runs a theme park essentially - he brings people to the circus rather than doing the “old fashioned” bring the circus to the people on a train across the country. Of course, his main problem is the need for funding/money, so greed colors his actions and the need to make money at any cost plays into his motivations and actions. The villain goes to the extent of sacrificing safety for money and inventing animals to attract customers - so, what is the movie saying about the person who literally created a theme park destination where families spend their hard earned money on frivolities? It’s an odd juxtaposition to sit in a theater in Walt Disney World and see this portrayed on the screen. It really makes me wonder who signed off on this one. So there it is - overall, a decent movie but nothing to exclaim over. I think this will honestly take the Mary Poppins Returns route and coast through the box office with no major hits or dips. People are really just biding their time till Endgame. There will be more to discuss, so tune in for our audio review on this week’s podcast where I will get more voices to give their own opinions on Dumbo - stay tuned!! Captain Marvel is the latest entry in the MCU lineup, and my most anticipated of 2019. This is finally the first movie with a female superhero lead, though it still boggles my mind that Black Widow never got one, and takes us back in time with Carol Danvers origin story as Captain Marvel. After Black Panther’s break through last year and success with seven Academy Award nominations, this movie had some big shoes to fill. So, the question is, how did our lady do? First, some spoiler free thoughts for those who are still pending a viewing of the film. As a woman, I was clearly on the train for a good superhero film. I enjoyed Wonder Woman immensely and felt that, while it had its own hurdles, the film was one of DC’s best in a long time. With that qualification, I can say that I actually enjoyed Captain Marvel more than Wonder Woman. I loved the 90s soundtrack in the movie, which I found more engaging than Guardians of the Galaxy Vol. 2. The character development was done well, though there were no crazy twists and turns that were not televised. It was also interesting to see the “start” of the MCU - the pre -Avengers Initiative pitched by Fury at the end of Iron Man, which I still remember got a huge pop in the theater. The very opening of the movie will get a tear out of every Marvel fan. The colors popped when they really needed to and the special effects were gorgeously integrated into the movie that allowed it to feel grounded while taking you to the skies. The only issue that I had with the film was in the first half of the film - the camera work in the fight scenes. I don’t like that hand-held, close up view of a fight - pull back and let me see what’s going on. Other than that, I can confidently say that Captain Marvel did not disappoint and made me excited to see how they continue to use the character going forward. Alright, now let’s enter into spoiler territory. From here on out, I want to dive a little more into specifics, but I won’t go into the entire storyline as I think that that’s not as important as some pieces. First, I feel like I should say that, while I have dabbled in the comic book world and enjoyed my fair share of Marvel, I have not had the opportunity to read Captain Marvel and so I was not familiar with her, her story, or even the differences between the Skrull and Kree races - the only exposure to them was via the MCU films and the Agents of S.H.I.E.L.D. television series (which I have unfortunately not had time to keep up with for the past few seasons). However, even with my limited knowledge, this film did a great job of ensuring that no prior understanding was required. I’m sure if you had more familiarity there might have been some fun nuggets, but nothing was necessary for this viewer’s enjoyment. As a movie that played around with timelines, there’s always the possibility of confusion on the viewer’s part. However, this movie, while giving us plenty of glimpses into Carol’s past, was never disorienting to the extent that I was taken out of the movie or had difficulty following the storyline. They did a brilliant job casting McKenna Grace, who you may have seen as young Theo in The Haunting of Hill House, as teenage Carol - she again shows great acting acumen and promise for great things in her future career. The sequence where we see the greatness that makes Carol superior than any Kree allows Grace to shine as brightly as Larson and cements the fact that it’s not how many times you’re knocked down, but how many times you get up that matters. Without that terrific young actress in this role, I feel that the movie might have not have had the impact it did, especially with younger viewers. Ok, so, let’s discuss a bit more about our heroine. While Marvel loves to have the main character tied to someone that is already familiar to the viewer, I feel like it’s done in such a different way in this film that I don’t think it’s actually comparable to the prior situations. Usually, the new character, despite being the main character, can sometimes be outshone by the familiar face - or rather the familiar face is there to help our character because the main character has some weakness that precludes them from fully realizing their true potential and the familiar character acts almost as a guide of sorts. In Winter Soldier, Black Widow is there to help Captain America navigate the new world on his own and his dealing with what Bucky has become. In Spider-Man: Homecoming, you had Tony there to guide Peter in this new life as a superhero with all the fancy gadgets, though the scene in Civil War should have given it away that Peter was doing pretty well in his friendly neighborhood hero role. Many times, the films seem to force the main character off to the side while the familiar face walks them through their own film. Here, however, in Captain Marvel, Danvers is not overshadowed or pushed aside. While we have Fury as the familiar face, Danvers actually takes on the role of tutor to Fury’s young agent. He has no idea about the vastness of the universe and what is possibly out there that could threaten the world he is living in. Danvers never needs to rely on Fury, at most, they work as a team with both characters holding their own. And the fact that they did not brush aside our main character shows that the writers knew they could not do that to our female heroine - which is similar to Wonder Woman. Both of these heroines show that they do not need the male counterpart in their film to be successful or to get things done. The writers also gave Danvers a great sense of humor - while she’s not as one-liner witty as Starlord or snarky as Stark - she has her own understated humor that hits when it needs to but doesn’t define her character. The other great part of Danvers is how she carries herself. One of the people I watched the movie with denoted that Danvers holds herself with confidence throughout the film, not cockiness. This distinction allows for the viewer to fall in love with her more than say the cocky Iron Man or Starlord, who come off as somewhat obnoxious at times. I love that there was no typical woman discovering her strength or beauty - Danvers knew she was strong but once she realized how strong she was throughout her life, she became even more powerful. Speaking of strong women, Danvers counterpart Maria Rambeau is another character worthy of praise. I loved that not only was she Danvers flying partner, they had a deep connection that was clear despite the small pieces that the viewer gets of it. There was no typical girl fighting or competition that can sometimes tank female relationships. Both women had their own strength and they recognized the other’s. An important scene that needs to be called out is the one where Danvers shows up to Rambeau’s place after the years she’s been “dead” - there was no fighting or hurtful doubting that soured their relationship. It was acknowledged that Rambeau was deeply hurt that her friend had gone, but she didn’t need it explained that Danvers had no control of her disappearance. They did what the best of friends can do - they easily fell back into their friendship routine of jokes and taking care of each other. This is what true female empowerment is about - no bitterness or jealousy, just understanding and love. You want to embolden women - show this type of relationship more in movies. Speaking of relationships, I need to point out the thing that was lacking in this film - but that was lacking in a good way. There was absolutely no love interest for Danvers. There was no time where she was put into that trope of female in love - the closest we get is her friendship with Rambeau, but this does not prevent her from taking care of what she needs to take care of, at the end especially. They didn’t do the love interest with Danvers’ teacher or some past love that she was trying to figure out. This film allowed Danvers to shine as her own independent person without being defined by someone or something else controlling her emotions. If anything, this film shows that being in control of your own emotions, while acknowledging they are there, is its own super power. Jude Law’s character, Yon-Rogg, is the one pushing Danvers to be less emotional - a clear parallel to how women are spoken to most of their lives. How many times do we classify a woman as “hysterical” while a man doing the same would be “passionate”? Yon-Rogg constantly tries to push Danvers to put away her emotions, but she finds out that there is power in harnessing those emotions and allowing them to work for her. Fighting them just leads to worse outcomes, while embracing them, along with her entire being, takes her to the next level and puts her above everyone else. She can truly do anything once she accepts who and what she is - all of it. I can’t think of a better message for all females. While I’m sure there’s plenty that I missed after my first viewing, I can say that this movie did not disappoint. It lived up to my own internal hype and brought me a strong female character that I want to show off to everyone. Celebrate women and support this movie by going to see it on the big screen. Show Marvel that they should have done a female-centered movie long before this, but if waiting allowed this to be their first, then huzzah! To simply use the phrase “practically perfect in every way” is cliche, but it is absolutely the truth for Mary Poppins Returns. From the amazing score to the brilliant cast to the obviously dedicated crew, this movie shows what a new creation can do while lovingly holding on to the past. While Disney has been on a run of recreating many of its beloved classics lately, this one shows how, when the time and effort is made, something unique can be created that is a wonderful reflection of the old material. First, we must talk about the multiple homages to the original movie, which are carefully crafted so the film is not just a blatant re-telling of the same old story. The painted scenes have a newer look, which is perfect for highlighting that the time frame of the movie has also progressed beyond the original’s setting, while the score, hauntingly familiar yet strikingly new, guides the viewer on the journey of the film. Each note is carefully crafted to tickle the back of one’s mind while transporting the viewer back into the world of Mary Poppins. Not only is the score breathtaking, but the songs themselves are especially crafted to tug at heart strings and leave one open to the vulnerability of feelings that many don’t have after reaching adulthood. While many knew Lin-Manuel Miranda was a shoe-in for his musical performance, the other cast members don’t let him outshine them. Emily Blunt continues the sweet gentleness of the Poppins character that Julie Andrews first displayed while telling us to “Feed the Birds” and also gives us more of the fun and spunkiness that was initially brought by “Supercalifragilisticexpialidocious”. Blunt also brings more whimsy and lightheartedness that Andrews only allowed to peak through during her portrayal. Another standout has to be Ben Whishaw, whose portrayal of Michael Banks adds to his range as an actor. He shows the vulnerability of a grieving spouse, the stressfulness of raising three children alone, and the joy that can come when your priorities are finally in line. Emily Mortimer is a doll and perfect as Jane, and the child actors are perfect, which can be a rarity indeed. Unlike the original, the film actually sets up unlikeable characters (dare I say villains), which is a nice change from the original. It also allows the Banks family to not have a “villain”, and shows that the Banks children at least learned the lesson their father needed to learn in the first film. It’s important that things from prior movies stick (looking at you Infinity War), and the characters in this film demonstrate that the lessons Mary initially taught them have not gone completely. It also makes the plot more interesting to have outside forces affect the Banks family, beyond the forces of good. While the entire cast shines, one might say Meryl Streep’s character, while an interesting addition in the Poppins lore, did not have the same impact as Uncle Albert and the “I Love to Laugh” section. It brought did help in the character development of the film, but there is a clear plot thread that is left dangling. It’s not enough to take one out of the film, but it definitely had a couple of us at the end question if that thread was resolved or not. While I know the composer enjoyed the song for Streep, it just feels a little out of place. Or, perhaps, it was the affected accent that took me out of listening to the song and attempting to understand all the words - multiple listens to the soundtrack will hopefully help, as well as another few viewings of the movie. Overall, I cannot recommend this movie enough. For those who enjoyed the first, this is a perfect compliment. If you like the original, but maybe don’t have the same fondness as some, give this one the opportunity to fill that place in your heart. It achieves what Disney seems to be have been running after for years - a perfect sequel to an old film without impinging on or just outright copying the original beat for beat. There's many themes in the latest release from Disney - Christopher Robin - themes of growing up, forgetting the carefree attitude of a child, or even the loss of innocence in war. However, there is one theme that struck me right across the face and left me a blubbering mess throughout the movie, and that was the theme of losing one’s self. From here on out - if you haven't seen the movie and don't want anything spoiled - stop reading and go enjoy the movie. I'll be here when you come back. Ok, so for those of you who have just come back from seeing this adorable film, let's discuss what I alluded to in the opening. 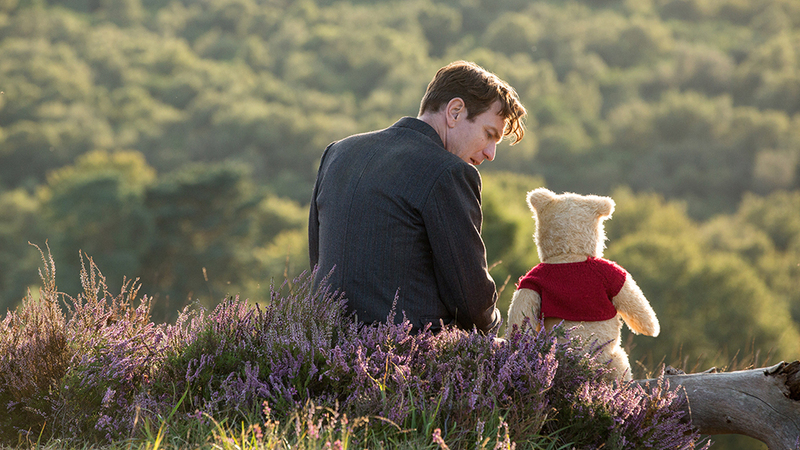 Christopher Robin, the film, is a great addition to the Disney film archives. The details are wonderful, the animation and look of the film is unique and breathtaking, and the theme of growing up and losing the innocence of childhood are all packed beautifully into this 2 hour film. Yet, there was just a little bit more that I connected with, and that's the idea of what it means to not be yourself. Struggling with mental illness, as many people do, I have been in a deep, dark hole where I cannot even recognize myself as I used to be. It's during those times, when the sadness is constant and the depression feels so great, that I look at myself and I don't understand how I became this person. I then question if I can ever be that happy person that I once was, what feels like so many years ago. When Christopher finds himself in a deep hole, literally, I couldn't help but see my feelings illustrated on the big screen. Here he was, this man who had just lost his best friend because of how he acted - instead of being the fun, imaginative boy, Christopher was an angry, loud monster - stuck in a deep hole and unable to climb his way out. We hear Pooh tell Christopher to not let him go. Behind the tears that this immediately brought to my eyes, I could almost hear my own friends say the same thing - don't let go. Don't let go of who you were and don't let go of the people who are in your life to help you. It is easy to isolate and stay stuck down in the hole by yourself, but in the end, this accomplishes nothing and leaves you even more alone than how you felt you were before getting stuck down there in the first place. So there we are - Christopher has turned into the monster, has lost all his friends, and he is stuck in a deep hole. Luckily a little (or rather a lot) of water comes to lift him out of the hole. Then he must go and find his friend because he realizes that he was wrong - water once again giving us the symbol of rebirth and renewal. On the way to find his best friend, Christopher finds others who also once knew him long ago, but they don't recognize him now. They cannot see behind the darkness that has transformed Christopher from the young happy child into this gloomy adult, and so it is up to Christopher to show them that he does remember how to imagine and play. Once he does this, once he opens himself up and becomes vulnerable, they can finally see that, yes, this is the person they once knew as their friend. On the surface, this comes off as a simple game of make believe, yet the reality of getting out of the hole and learning to act as you once did, happy and carefree, is a longer process. Sometimes it's something you have to fake - pretend to be happy until you are - and then you can see that the you that everyone remembers, the real you, is still there behind the darkness that wants to turn you into something that you are not. Christopher's journey in the movie is a shortened version of what people like me are going through, but the end result is the beacon of hope at the end of the tunnel. His friends helped him in his time of need and, despite having much to deal with in his own life, Christopher realized that putting his friends and family first helped him become a better person than he had turned into. Christopher changes by the end of the film because he learns that certain things in life matter more than others. But the beautiful thing about all of this is that he could not have come to this realization on his own - it took the persistence of a great friend to keep pursuing him, to keep sticking around, and to keep taking steps to make sure that Christopher got the help he needed. While Pooh's help comes off as clumsy or accidentally helpful, we know that without him being there, Christopher does not see the error of his ways and does not turn his life around. Of course it's a movie perfect ending, but the hope that this hardship in life will pass and the days will be sunny again is truly what makes it all worth it. And, of course, the guarantee of friends being there for you at the end of your darkness makes the journey out of it all the much more worth it. So, if you're like Christopher, trust that there is something better for you out there, but you need to be willing to let go of the darkness and the belief that this is just how life has to be for now. You have to be willing to attempt to get out of the hole. If you're like Pooh and have a friend who you can see is losing their selves, please, don't give up on them - your light may be the thing that leads them out of the darkness. Fourteen years ago, a superhero movie was released and has been one of the best family superhero movies to date - The Incredibles. While the film is very much centered on Mr. Incredible's journey, there is also an element in the film that may be overlooked- that of female roles. Despite being written by a man and coming out in 2004, The Incredibles is very much a woman-centric film. Let’s dig in a bit. One of the main issues this movie tackles is gender equality and it does this better than most animated movies. At the start of the movie we see Mrs. Incredible, aka Elastigirl, as a superhero in her own right. The movie demonstrates that it is possible for her keep her own identity even while wearing additional hats as a wife and mother - she never allows those hats to overtake who she was in the opening of the film- they simply add to who she is. This can be a tough thing for women, as it is so easy to put your family’s needs before your own (even down to the simple act of not putting makeup on to leave the house because the kids/the schedule won’t allow you to). We see that Mrs. Incredible keeps the family together - the kids are taken care of, the house is unpacked and cleaned, and she even tries to make sure her husband is involved in the kids’ lives. You get the impression that if Mrs. 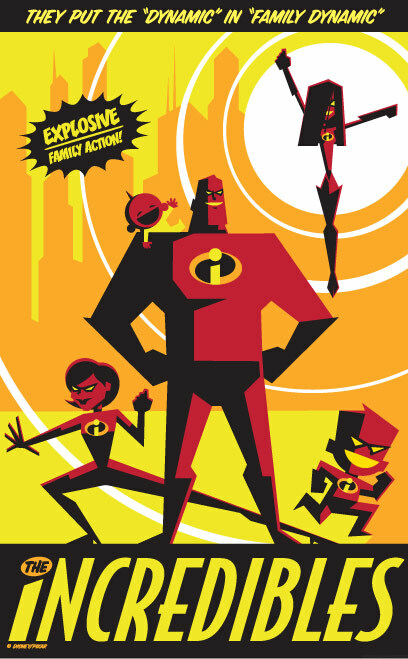 Incredible were out of the picture, the family would crumble into chaos (which makes the premise for Incredibles 2 very interesting). She is the epitome of the strength that Mr. Incredible is so fearful of not having enough of, which makes his fear of losing his family or having them injured so crippling to his actions. Mrs. Incredible only has one moment of vulnerability, which she is quickly snapped out of by her friend Edna Mode (a true girlfriend indeed). While the situation of tracking down her husband (and having her children stow away on the plane heading into danger) would typically be one to send many of us into a panic attack with anxiety up the wazoo, she is calm and collected. The writers don’t put her into the “typical” woman mold - thankfully. Instead, she is shown that she was, in fact, stronger than her husband - demonstrating that physical strength will not always be enough. The movie also addresses other themes facing girls/women, including being confident in yourself, as we learn from Violet. She is like many females, especially young teens, who don’t necessarily like who they are and/or are not comfortable with who they are because they don’t fit a certain mold (the pretty popular type). Of course once she accepts who she is, she excels as both a superhero, a sister, a daughter, and even a teenager (date with Tony). While this is not necessarily a theme only for the modern age, it is quite appropriate for the modern female. It seems that only recently have girls been encouraged to be themselves, whether this pertains to body shape/appearance or being comfortable pursuing a career or a family. Violet is shown that it is important to love herself and embrace her “flaws” as these are not necessarily things to hide, but things to embrace. Once she allows herself to do this, she is free to just be herself, which is more than good enough. Additionally, the movie has your typical woman side-kick in Mirage, but she does not stay in that "typical" role for very long. While she initially does what Syndrome wants, at the first turn where he shows his true colors, she is willing to give up on him and side with The Incredibles. The film does not let this woman become another dumb female, made stupid by her feelings towards a man in power. This small, simple role shows the greater depths of how a female character can be better written and better handled. So as you can see, while The Incredibles has many themes, many of them that are focused on strong women embracing themselves and their choices - which is very interesting as this movie was written by a man. This same man is the force behind the sequel. Interestingly, the sequel also has many female leads and themes centered around these female characters. I want to briefly discuss The Incredibles 2 here- I’ll try to avoid major spoilers but if you haven’t seen it, you should do that first. The Incredibles 2 begins where the first one left off, so the audience doesn’t have to spend time playing catch up in our characters’ lives- which also means that the characters haven’t had time to grow/change without the viewer knowing. This movie, as shown in previews, focuses on Mrs. Incredible, or as she is more frequently called throughout the movie - Elastigirl - and her own dealings of being a working mother. While the movie plays on many parenting tropes, we see how things were handled quite well by Mrs. Incredible. Now, I’m sure I will hear the comment that, well, she didn’t have to deal with Jack Jack’s emerging powers as well. However, she was able to handle Dash’s school issues (a bit more since he was a more of a troublemaker in the first movie), Violet’s constant insecurity, and Jack Jack, who was younger, thus needing more attention. She also had to contend with the issue of her husband’s possible infidelity/secretive nature. I think it’s fair to say that both parents had their stay-at-home parenting job equally as difficult; yet, Mrs. Incredible never seemed as ruined as Mr. Incredible does in this movie. Once again we are shown Mrs. Incredible’s extraordinary inner strength- in the first movie, it was her ability to handle the switch from superhero to stay at home mom; now it’s from stay at home mom back to superhero, but one with a family to think of and worry about while she is out on her missions. The movie once again emphasizes how well Mrs. Incredible can handle multiple responsibilities. Another component to this movie is Edna Mode. She embodies those women who focus on career over family - something she clearly indicates is her own decision. However, we are also given the glimpse into her life where she is able to have her chance to babysit Jack Jack. Despite having little-to-no maternal instincts, she is able to succeed in both competently taking care of the baby, as well as designing a very unique supersuit for him (in one night as she emphasizes). Here we are given the character who is able to enjoy her career life, as well as some of the mothering that is inherent in every woman. She is not simply a character for quippy phrases and humor - she is an example of how a woman can pursue her career without feeling that she lost something because she decided not to become a mother. We can't discuss this movie without going back to Violet. Just a moment before this movie, she had grown so much and developed into a, somewhat, confident teenager. Yet, much of that is tossed into the wind once the second movie starts and she is back to being this awkward girl trying to find her place in the world. What makes Violet's character great is that she does not revert back to being the shy wall-flower, but now has to grow even more. I find she is one of the most relatable characters because she has so much thrown at her, yet she does not back down and retreat. She continues to stand up and face the world, as crazy as it is. Perhaps this is because of who her mother is and the qualities she has learned from watching Helen throughout her life. Speaking of watching Helen, we also get introduced to another female character Voyd. And while we don't get to know much about her beyond her superpowers, we do get the glimpse into what happens when females have strong, powerful females to look up to. Voyd was in a similar situation as Violet- she has powers but cannot use them for fear of being called out as a super. Having Elastigirl once again come forward and show how great being a super can be gives Voyd the confidence to be her true self. I feel like this character is there not only for women, but for anyone out there who is uncomfortable in their own skin and only becomes confident once they see someone else like them become successful and loved. Again, not something solely for the females in the audience, but something they can connect with very deeply. Overall, these movies are superb. I think the closer you look at them, the more it becomes spectacular that they are able to say so much about society, particularly about women, despite the fact that they were both written by a man. Fourteen years is quite a long time for a sequel, but it was worth the wait as we are able to continue this journey with our favorite superheroes - especially our favorite super mom.